Middle eastern deliciousness in Nolita! Last Saturday, after reading a great review in the New York Times, D and I decided to check out Balaboosta, in Nolita. I’m always looking for new, healthy restaurants to go out to in New York city and I was definitely not dissapointed. From the same lady (Einat Admony) who brought Taim (healthy falafel in the West Village), this place is a true Middle Eastern gem! D and I shared a bunch of small plates — the hummus and pita were to die for (the pita was warm and doughy – not the cardboard style you get in grocery stores), the garden salad was lemony, fresh, and delicious, and the grilled calamari bruschetta with tahini spread was absolutely divine. As far as portion sizes, stick to sharing a bunch of the small plates – which are hefty even for two people, and a lot more interesting than what was offered on the main courses. The best part — most of the food is really quite healthy — with a veggie-driven, organic focus and less use of fats to flavor the food. 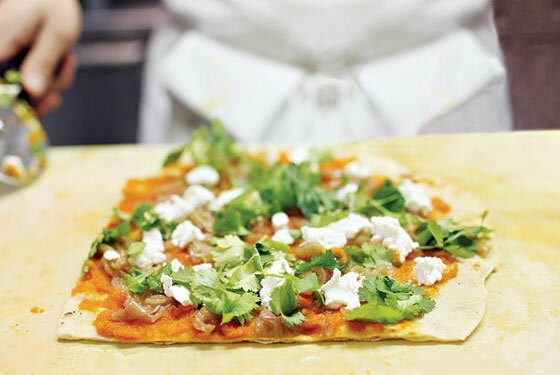 I’m definitely going to be going back soon to try the carrot-puree, goat cheese pizza! I HIGHLY recommend this place as a great date spot, and also a fun place to take friends. The noise level can be quite high, so I recommend trying to snag a seat in one of the corners of the restaurant. The best part – it’s a great meal that you don’t have to feel guilty about! OH PLEASE TAKE ME WITH YOU! The NY TIMES gave it such a glowing review that i was afraid to try to get in so soon! Do they take reservations? I would LOVE to go again. The NY times did not do it justice — that’s how amazing it was! And they do take reservations and were super accomodating (i only called a week before). Can’t wait to go – maybe even with GS! !